When I tell people I play the euphonium, most of them look at me blankly and wish they’d never asked. And I explain, “oh, it’s just like a slightly smaller tuba”, and hope they know what a tuba is. But really a euphonium isn’t much like a tuba at all. We may play the bass part a lot of the time in windbands, but we are in fact the chief tenor soloists. We are important! And it would be lovely to be appreciated, or at least half as well-known as trumpets are. This post is meant to clear up any doubt there may be regarding what a euphonium is, what it does, and what it doesn’t. I’ll begin with its origins. Like many bass wind instruments, the euphonium itself can be traced back to the Serpent, an eighteenth century bass instrument used in military bands and church choirs. It had six holes to be covered with the fingers, but for this reason, the Serpent had serious intonation problems. The Serpent, in all its slithering glory. 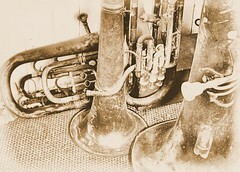 In 1821 the Ophicleide was produced. Like most modern woodwind instruments it was constructed with keys to cover tone holes, allowing slightly better evenness of sound. Over the next few decades, valve mechanisms were developed, which helped both the manufacture and intonation of instruments of all types. To an observer, pushing down a valve seemingly lowers the pitch of the instrument. In practice, this is because the valve is a type of ‘cross-road’ piece in the tube, with holes in it through which the air can pass. When pushed down, these holes align with the network of tubes through which the valve compartment passes, allowing the air to enter other regions of the instrument. This increases the length of the instrument, therefore lowering the tone; and if you’re a physicist, and you know all about the relationship between bore distances and the sound wavelengths they produce, you’ll understand exactly why. If you don’t, just take it for granted. According to Wikipedia, the modern British euphonium was invented by David Blaikley in 1874, and its design hasn’t altered much since. We usually have either three or four valves, the fourth valve allowing us to play lower notes that would otherwise be out of range, and we are pitched in concert B flat. This means, to quote Wikipedia (it’s okay; I don’t use Wiki all the time! ), that the open notes are ‘partials of the B flat harmonic series’. In simpler language, this means that when no valves are pressed down, the instrument will produce the notes B flat, D and F (though the higher you get, the more notes you can play on open). These make up the arpeggio of the B flat major scale. Although there are international difficulties relating to the names of many instruments, in England we use the word ‘euphonium’ to describe what I play. This is derived from the Greek word ‘euphonos’, meaning ‘well-sounding’, or ‘sweetly sounding’. A baritone, it must be said, is smaller than a euphonium, with the same range but greater flexibility in the upper register. You can apply to this the same logic I used to explain the mechanics of valves. But anyway, whatever you do, don’t insult a euphonium player by calling him or her a ‘bari’. There are different types of euphoniums, too. Double-belled euphoniums are a creation unique to the US, and there are marching euphoniums which look rather like enormous cornets. Tenor horns are even smaller than baritones, set a perfect fourth (I believe) above the euphonium in pitch. I have one of these, too, and I love it, but they’re even less useful than euphoniums in the musical world. Euphoniums aren’t used in orchestras, which is my greatest regret. It sets us apart from the rest of the brass section, because however many snooty upper register solos we get in brass bands, we’re still unwanted in the biggest musical group of the lot. Sad, really. Anyway, it’s to do with tone. Perhaps to a non-musician this doesn’t make much sense, but euphoniums have a much broader, fuller timbre. This is due to their conical bore: the tube that constitutes the instrument gets gradually wider from the mouthpiece to the bell, producing some kind of special wavelength. Trombones are mainly cylindrical, meaning the bore has a constant diameter, except for the conical mouthpiece at one end and the flaring bell at the other. Woodwind players are especially fascinated by the fact we can ‘lip’ any notes up and down, increasing the flexibility of the sound. Stephen Mead is one of the most renowned British euphonium players, and I have one of his albums on my iriver. Yes, I’m a brass player. Not just any brass player. I reside down in the lower brass. Squidged between a row of uproarious trombonists and the rather intimidating bell of a tuba, the king of the brass section, is me. I play the euphonium. I get lonely. Even amidst all the lovely brass players I know, who are truly hilarious, the euphonium player must remain aloof, for some of the reasons I’ve explained above, about our detachment from the trombone section and our different span of usefulness to many of the other brass family. I’ve also been the only euphonium in my bands for the past two years. Whilst the five trombones have the most hilarious camaraderie (plus they’re all boys, lucky them), I’m a bit of a one-man band (no pun intended). I didn’t even have my friends in the same bands, because I passed Grade 7 earlier than they, and besides, I’m the oldest euphonium student I know (save one, who doesn’t practice). And here’s what we’ve all been waiting for. Meet Florence – my euphonium. In conclusion, the euphoniums mentioned in the third verse of Meredith Willson’s famous ‘Seventy-Six Trombones’ are not just a myth. We exist, and despite our lack of recognition, we’re proud to be who we are.